SAN DIEGO – A new public walkway connecting America’s Cup Harbor and Shelter Island is now open, marking the completion of the first phase of the planned Intrepid Landing marina and boatyard. The promenade connects Point Loma Seafoods on the project’s north side to Shelter Island Drive along the property’s south edge. The new boatyard is being built on a portion of the old Kettenburg Boatworks grounds by Driscoll Inc., a family owned business that runs and operates Driscoll Boatyard and Driscolls’ Wharf on Shelter Island. The first phase included the completion of a new 38-slip marina and the promenade. Construction on the upcoming phases 2 and 3 is expected to begin in early 2013 and will include creation of the boatyard, office buildings, a new restaurant and a dry boat storage yard. 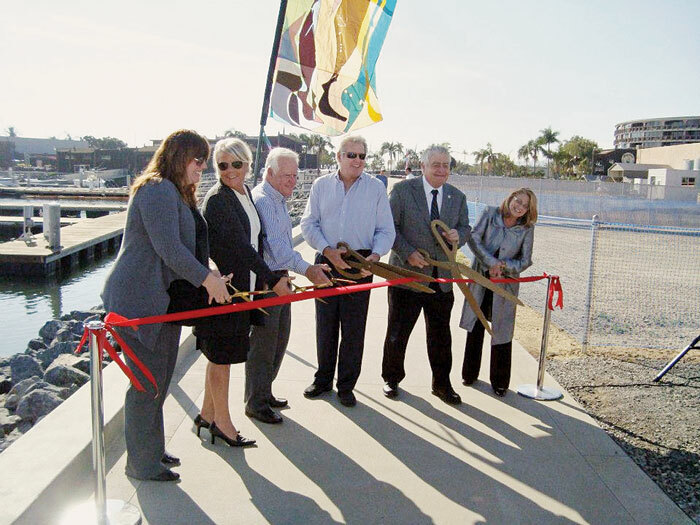 A ribbon-cutting ceremony was held Dec. 12 for the opening of the promenade, with city and port officials joining the celebration. The newly opened public walkway that will allow easier access for walkers and cyclists around America’s Cup Harbor. Tom Driscoll, president of Driscoll Inc., took control of the Kettenburg properties in the 1990s when the historic boatyard ran into financial troubles. The land was then divided into two portions: city-owned land not connected to the water, and Port of San Diego-controlled land where the Driscoll family has planned their project. Intrepid Landing is built on the waterside portion, with the 1.65-acre upper portion set to become a mixed-use development featuring commercial operations on the bottom floor, with 36 townhomes built on top that overlook the boatyard facility and marina planned by the Driscolls. The plan for Intrepid Landing was originally conceived by Tom and his father, the late Gerry Driscoll. Gerry Driscoll originally started working in San Diego Bay in 1947, founding a boatyard repair and maintenance facility. The new project, Intrepid Landing, is named after Intrepid, the boat Gerry Driscoll skippered in the 1973-74 America’s Cup campaign. Intrepid Landing is designed by Miller Hull, an architectural firm based in Seattle, with previous designs that include Pier 32 Marina in National City and Point Loma Marina in America’s Cup Harbor. The entire project is estimated to cost $6.3 million, and is being done in a partnership between Driscoll Inc. and William Ayyad, president and founder of United Development Group Inc.